Terry Hei Hei # ? The CSIRO has regions for projecting the impact of Climate Change. See https://www.climatechangeinaustralia.gov.au/en/climate-projections/futur... This sub-state, Darling River Sub-State (S1), is included in one of the clear projections in a CSIRO cluster called "Rangelands region". CSIRO's Rangelands region coincides with BloggerMe's L,M,X (missing a tiny bit), R (missing a tiny bit), but includes a large bit of S (the Darling River Sub-State bit West of the Central Slopes region). The CSIRO has regions for projecting the impact of Climate Change. See https://www.climatechangeinaustralia.gov.au/en/climate-projections/futur... 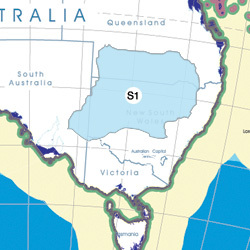 This sub-state, Darling River Sub-State (S1), is included in one of the clear projections in a CSIRO cluster called "Central Slopes region". CSIRO's Central Slopes region coincides with a large bit of S (the bit that is the eastern half of the Darling River Sub-State). "Early in the 20th century it was thought that the Northern Hairy-nosed wombat was extinct, after the disappearance of the only two populations then known (one near St George in southern Queensland, the other near Jerilderie in New South Wales). Then, in the 1930s, a small population was discovered in what is now Epping Forest National Park in central Queensland. This population was in decline, and by 1982 there may have been only 30 or so animals left. "In that year cattle were removed to protect the wombat’s habitat. Monitoring the population to find out if this caused an increase in numbers was difficult. Northern Hairy-nosed Wombats are not only nocturnal, they are extremely shy, and therefore difficult to observe. A capture and release program in the late 1980s and early 1990s suggested a population size of about 63." "Fracking in Australia: Gas goes boom | The Economist http://econ.st/LJ7eP1 June 2012" Is Australian industry protecting our water in 2013? Toowoomba: Extreme weather & the knowledge controversy? Amazing photo: "@bevanshields85: This #Coonabarabran ash/smoke cloud pic is by Baradine resident Allison Canham pic.twitter.com/p9GQH23O"